Over the past six months, we have highlighted a number of local bushland campaigns aiming to protect urban bushland. Where are those campaigns now? There have been some wins, some losses and some still unresolved. March 2019 update: the developer has withdrawn their application for a Clearing Permit. If it had been approved, this clearing permit would have affected coastal dunes in Trigg Bushland (Bush Forever site 308). Read the original story here. Thank you to local campaigners for their support to stop this land being cleared for an unnecessary fire break. March 2019 update. The Minister for Lands refused the sale of Crown Land to the City of Melville because it is clearly identified for conservation. Its proposed purchase by the City had been key to facilitating a commercial lease for the construction of a massive wave park in Bush Forever Site 331, adjacent to the Swan Estuary Marine Park. 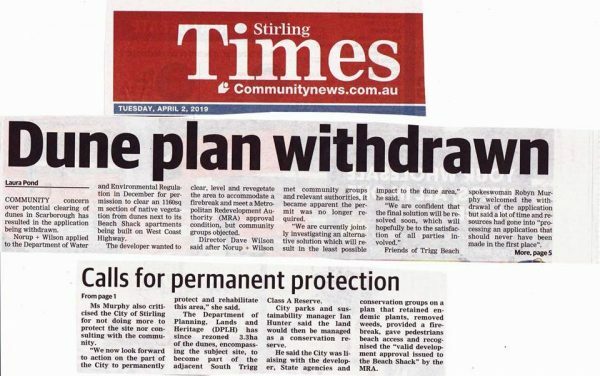 The Crown Land had been clearly identified for conservation and local group and UBC member SERAG campaigned strongly against the wave park on environmental grounds, as did other community groups such as the Alfred Cove Action Group Read more here. April 2019 update: Premier McGowan has renewed WA’s 20-year bilateral Regional Forest Agreement (RFA). In signing the RFA, the Premier has favoured logging interests over action on climate change, conservation and community opinion. As outlined in our original post, the WA Regional Forest Agreement (RFA) signed 20 years ago by Prime Minister John Howard and Premier Richard Court exempted the WA logging industry from Federal environmental laws. Consequently, the RFA expires in May 2019. Sadly, logging is the only industry that enjoys a special exemption from Federal environment laws. Hence, renewing the RFA allows for continued logging of threatened wildlife habitat. 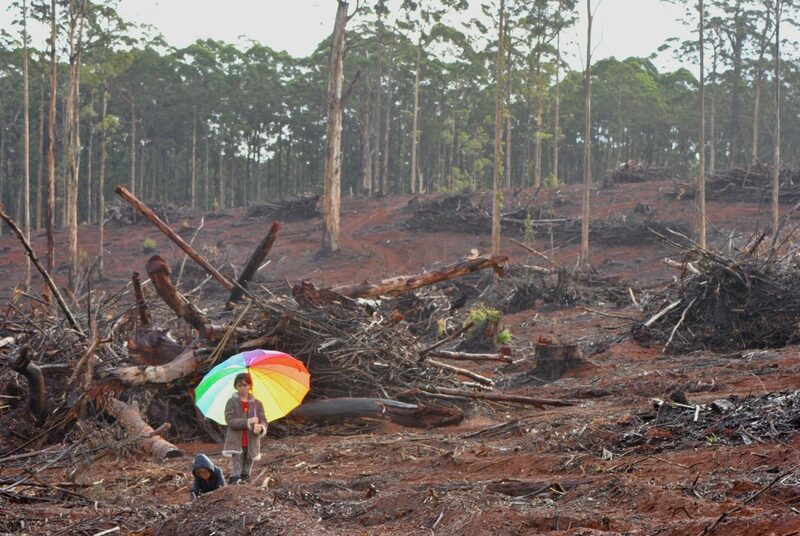 The WA Forest Alliance will continue to campaign for the protection of forests. In late November 2018 we thought the Lemnos Street bushland may be largely saved through a decision by the Statutory Planning Commission (SPC) of the Western Australian Planning Commission (WAPC) to protect the linkage. However, the WAPC then overturned the earlier decision of their specialist committee (the SPC). This then left the way clear for the developers to clear the bushland. Despite further advocacy we were not able to effect any change. As a result, we have lost another important ecological linkage. You can re-read the sad end to this bushland campaign through our blogs in October, November and January. Unfortunately, this wetland is still under imminent threat from development of the Maddington-Kenwick Strategic Employment Area (MKSEA). This development will affect a known cockatoo roost on Edward Street, Maddington. In the 2018 Great Cocky Count, this roost exceeded 300 red tailed black cockatoos. This matter has therefore been referred through the EPBC Act. Concurrently, the community campaign to save the 4th largest Kaarak roost in the Perth-Peel region continues with an event ‘ Count the Kaaraks’ on Sunday 7 April. Conserving our natural heritage requires perseverance and resilience. It involves increasing community awareness of environmental issues as well as advocacy and activism. It requires people banding together in groups: forming friends’ groups or joining peak bodies such as the Urban Bushland Council.